It seems like it was only a few years ago that we were tuning into our bookmarked blogs and fashion news outlet hungry for the now famous street style photos that fashion month always bestowed on us. But, like a rare Pterosaurs, great street style at fashion week came and went and only a few dinosaurs remain. Centenera is one, Taylor Tomasi Hill used to be another one (but I haven’t seen her this year in any street pics, although she reported for Goop in NY…), and Mira Duma (sometimes). Between these 3 big vectors there is slight in between movement in the right direction, but nothing grows too well in the shadow of dinosaurs, does it? On the other side, there is everyone else. From bloggers to passer-by’s, to fashion insiders, they all went overboard. The photographers make fashion week seem like a circus they said, a year or two ago. Well not it seems that fashion insiders are well aware they must play the buffoons, because there is no godly reason to wear everything but the kitchen sink, is there? Everyone tries too hard, does too much is too well-constructed and in an era where we praise that french girls, with their unstructured outfits and long-hair-don’t-care attitude, there is an acute discrepancy. We praise the simple yet show the cluttered. Back to basics might not be such a bad idea. Here are a few snaps from outside the shows that I loved. A few brights and a few neutrals, to please all. My absolute favorite? 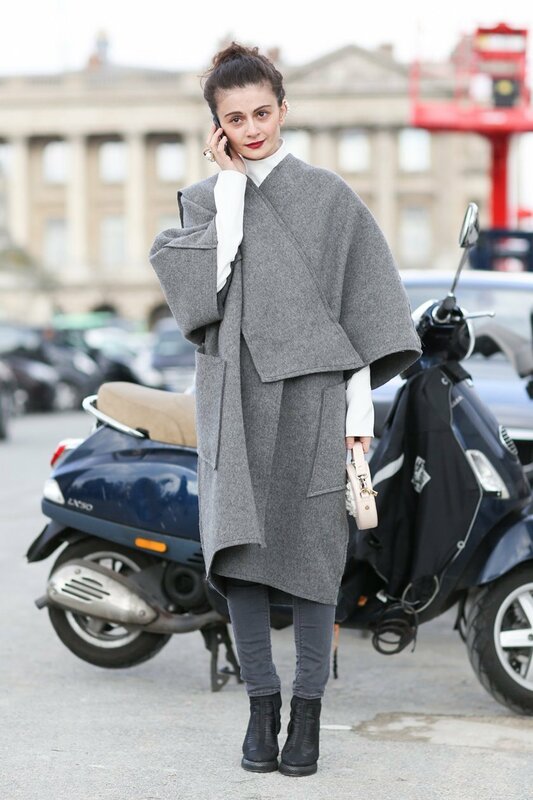 That lady right up-above and her perfect Rick Owens toggle jacket.